Do you constantly struggle in some way with sleep? Do you have trouble getting or staying asleep? Do you wake in the middle of the night unable to return to sleep, or wake in the morning feeling as if you never really slept at all? Or maybe you've even been told that you exhibit strange behaviors during sleep. Do you feel tired and worn down nearly everyday? If so, you might just have a sleep disorder. Approximately 80 million Americans suffer from a sleep disorder. And while there are over 70 recognized sleep disorders, some are much more prevalent than others. Here we describe the four most common sleep disorders that could be robbing you of quality sleep. 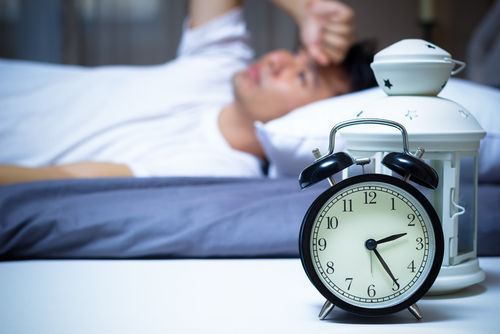 Insomnia is by far the most common sleep disorder with approximately half of all people having experienced symptoms occasionally, and about 10% of Americans reporting suffering from chronic insomnia. Feeling as if sleep was unrefreshing (non-restorative). Mood and behavior disturbances such as irritability, aggression, and impulsive behaviors. Decreased performance at work or school. Troubles in personal and professional relationships. Having accidents at work or while driving fatigued. Classifying insomnia varies on how long symptoms last and how often they occur. Acute insomnia is experiencing sleep loss over a short period of time, from one night to a few weeks. Chronic insomnia is when poor sleep quality occurs at least 3 nights a week for a month or longer. Causes of insomnia can vary from being associated with a medical or psychiatric problem, environmental influences, stress and worry, or simply occurring without reason. For more information on the types, causes, and treatments of insomnia click here. Obstructive sleep apnea (OSA) is the second most prevalent sleep disorder affecting roughly 20 million Americans. It's also estimated that up to 80% of people with OSA may not even realize it. While insomnia may be the most common sleep disorder, obstructive sleep apnea is the disorder most sleep clinics diagnose and treat. Obstructive sleep apnea is when a person's breathing stops for several seconds during the night due to blockage in the upper respiratory system. As one sleeps, soft tissues in the throat relax and collapse into the airway blocking oxygen from getting to the lungs. Partial blockage often results in snoring, and full blockage results in a cessation of breathing followed by gasping or choking sounds as breathing resumes. As a response to not breathing, the brain partially awakens from sleep to force respiratory effort to breath harder and get past the blockage. When this occurs several times an hour for several seconds at a time, the brain is never really allowed time to enter deeper phases of sleep where restorative bone, tissue, and cognitive functions prepare you for the next day. As a result, quality sleep is forfeited leaving the person feeling tired all day. Furthermore, the respiratory effort required during sleep to continue breathing and functioning puts a strain on the heart and can lead to all kinds of cardiological problems down the road including heart attack, heart failure, heart arrhythmia, and more. For more on causes and symptoms of sleep apnea click here. For more on diagnosing, treating, and consequences of untreated sleep apnea click here. Approximately 10% of adults and 2% of children suffer from restless leg syndrome (RLS) to varying degrees. RLS is a neurological disorder characterized by a persistent, sometimes overwhelming need to move one's legs (and occasionally other body parts), usually while resting. Sensations in the legs are often described as creeping, pulling, aching, itching, burning, and throbbing and the only relief is temporary movement or massaging of the legs. Restless leg syndrome is classified as a sleep disorder because the constant need to move one's legs during rest can have a severe impact on the ability to get to, and maintain sleep. Sleep loss is one of the most commonly reported side effects of RLS and leads to similar symptoms of sleep deprivation found in other disorders including diminished quality of life, excessive daytime sleepiness, memory impairment, cognitive impairment, and even depression. For more on causes, risk factors, and treatment of restless leg syndrome click here. Narcolepsy is a neurological disorder characterized by the brain's inability to control its sleep/wakefulness cycle. Approximately 1 in 2,000 people suffer from narcolepsy with over 200,000 Americans suffering from it. People with narcolepsy suffer from chronic daytime sleepiness and episodes in which they fall asleep unexpectedly during the day. These "sleep attacks" can occur at any time, during any activity. Sleep attacks are not limited to periods of dull or low engagement activities, but can happen during school or work hours, in the middle of a conversation, while eating, while exercising or playing sports, or most dangerously–while driving. Excessive Daytime Sleepiness (EDS). EDS is the most common symptom of narcolepsy and usually the first symptom to appear (usually between the ages of 10-20 years old). EDS is characterized by a chronic persistence of feeling sleepy and involuntary episodes of falling asleep without warning. Sleep attack bouts can last anywhere from several seconds to several minutes. People with EDS report it as feelings of mental cloudiness, a lack of energy and concentration, a depressed mood, or extreme exhaustion. EDS occurs even if the patient appears to have gotten plenty of sleep the night before, and usually persists throughout the day. Sleep Paralysis. Sleep Paralysis is the inability to move or speak while one is falling asleep or beginning to wake up. During sleep paralysis the sufferer is consciously aware of their surroundings but is unable to move because the body is still in REM sleep. During REM sleep, the voluntary muscles are "paralyzed" to keep people from being able to act out their dreams. Sleep paralysis usually lasts only a few seconds up to a few minutes with no permanent effects. Cataplexy. Cataplexy is very similar to sleep paralysis in that there is an involuntary inability to move muscles or speak. While very similar to sleep paralysis in condition, it is usually onset by varying circumstances. Instead of occurring at the beginning or end of sleep, cataplexy can occur at any time during the waking period and is usually triggered by intense emotions such as surprise, fear, anger, stress, or even humor. Cataplexy can also occur in various degrees of severity ranging from a slight loss of motor functions such as weakness in the muscles or drooping eyelids, to a complete loss of muscle tone resulting in physical falls and an inability to move or speak. During cataplectic attacks, sufferers are fully conscious of the event, but unable to control it. Disturbed nocturnal sleep. It may seem counterintuitive to believe that sufferers of narcolepsy would have have any trouble sleeping at night, but one of the most common symptoms is fragmented sleep. Just as people with narcolepsy have trouble staying awake during the day, they often have difficulty staying asleep at night. They can wake up to four or five times up to 10 or 20 minutes with no clear reason. Their sleep can be disturbed by insomnia, vivid dreaming, sleep talking, acting out while dreaming, and periodic limb movements. For a more indepth look at narcolepsy including diagnosis, causes, and treatment click here. If you believe you may be suffering from a sleep disorder you should talk with your primary care physician about your symptoms. If your doctor believes that your symptoms are signs of a sleep disorder he will usually usually refer you to a sleep clinic to have a sleep study. If you do not have a primary care physician you can contact a sleep clinic in your area for a consultation with a sleep specialist to determine if a sleep study is the best approach for diagnosis and treatment. The Alaska Sleep Clinic has been helping diagnose and treat a variety of sleep disorders for over a decade. As the most trusted sleep experts in the state, we have helped tens of thousands of Alaskans suffering from sleep disorders get the therapy they need for better sleep at night. Diagnosing patients is the easy part, helping patients maintain therapy compliance is one of the greatest hurdles a sleep clinic can face for its patients. The Alaska Sleep Clinic has one of the highest successful compliance rates for patients in the country due in part to a comprehensive program that helps patients maintain therapy through remote monitoring, automatic equipment replacement alerts, and the latest and greatest equipment for all of our patients. If you live in Alaska and would like to have a sleep study, click the link below to receive a free 10-minute phone call with a certified sleep educator now.